Convention & Visitors Bureaus and convention centers create custom maps with us to help sell their cities as meeting destinations and to maximize attendees. CVBs also use our print and online maps as a member benefit and in official visitor guides and at information desks. 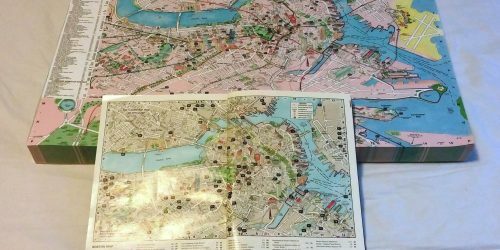 The Greater Boston Convention and Visitors Bureau uses a customized, closeup map in its Official Visitors Guide, along with a tear-off style tabloid map in its visitor centers. A suburban CVB combines customized print maps with customized online maps to promote event centers, hotels, and local attractions. Some CVBs cover the cost of fully customized online and print visitor maps by offering sponsorship opportunities to their members. Visitor-focused businesses appreciate the chance to get their name in front of tourists both before arrival and during the trip. Other CVBs cover the cost of customization with a minimal membership fee increase and offer supplies of maps to their members as an added member benefit. Our customized meeting maps are a 4-way win for the CVB, meeting host, sponsors, and attendees. Our online and print visitor maps are also popular in the convention sales departments of larger metropolitan CVBs. Our custom meeting maps can help attract meetings by illustrating important meeting features at a glance. CVBs can customize online meeting maps to show distance between key hotels and meeting facilities, numbers of hotel rooms within a specific radius of each meeting facility, the location of business services, dining options, and after-meeting entertainment choices near the convention facility. 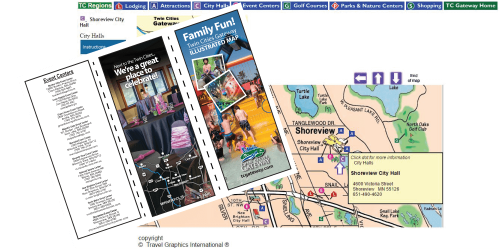 The meeting sales departments of CVBs either include complimentary customized print and online maps in the standard package of services offered to meeting planners, or they sell the maps via a license or distribution agreement with TGI.